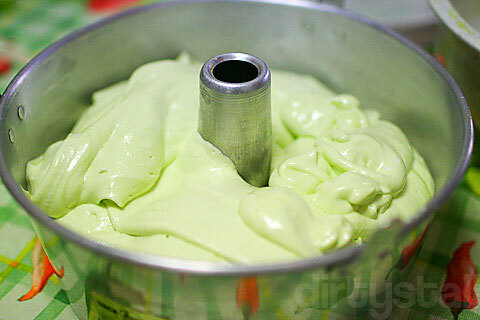 Over the weekend, I went over to learn how to make a pandan chiffon cake from my aunt, something she used to make for me as a kid. Although I have no interest in making cakes, I didn’t want to pass up the opportunity to try my hand at making one. The first step is mixing 1 tbsp pandan juice (that we squeezed out of pandan leaves) with 5 egg yolks, 100 ml coconut milk, 1/8 tsp apple green food coloring and 50 ml of corn oil. Next we added in 100 gm sifted white flour with 1 1/2 tsp baking powder and 1 1/8 tsp bicarbonate of soda, then mixed until smooth. 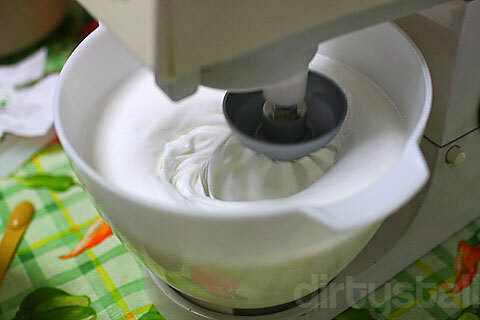 Separately we used the machine to whisk 5 egg whites with 1/4 tsp cream of tartar and 100 gm castor sugar until stiff peaks were achieved. 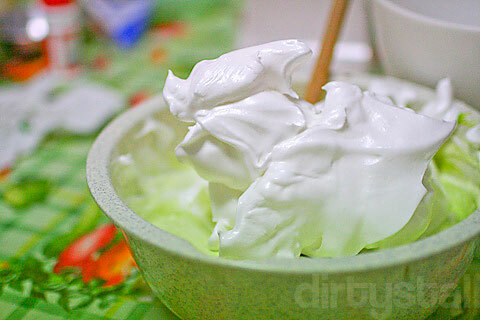 Then we combined the whisked egg whites with the pandan flour mixture and folded it in. 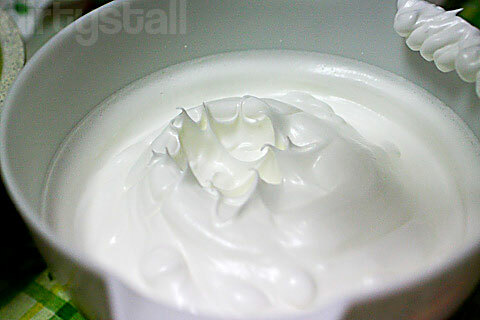 After mixing it well, we put it into the pandan cake mold and placed it in the oven for about 1 hour at about 150°C. Flipping it over now and cutting it into slices. 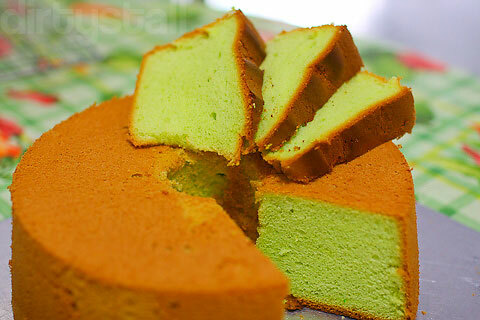 And here is the pandan chiffon cake, a true classic from the past! 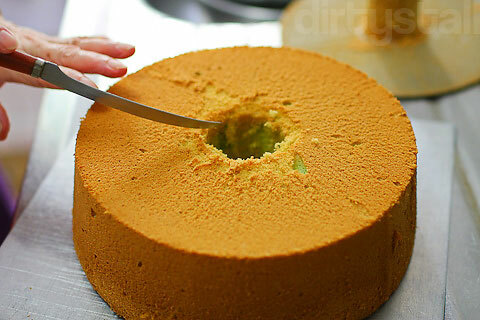 40 Responses to "Pandan Chiffon Cake"
Wow, your aunt must be an experienced baker. 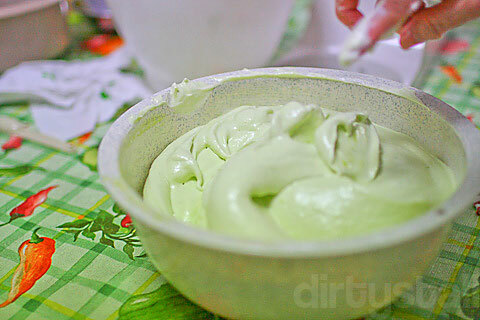 The pandan chiffon looks really good and browned so nicely! Yup she used to bake at home for a long time in the past but she’s retired now. So she just bakes for family now and then. Your pics are really good! … the chiffon just looks gorgeous! wow it’s really indeed a beautiful looking chiffon! I’m sure it tastes great too. What a gorgeous chiffon! 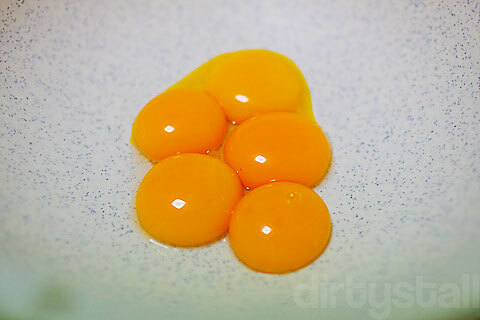 I also use equal number of yolks and whites but have seen many recipes using 1 more yolk. Hmm, wonder what difference does it make? Thanks! I don’t think it will make that much more of a difference, maybe a slight difference in texture and a richer taste? Looks great! I love that pistachio colored chiffon cakes so much. 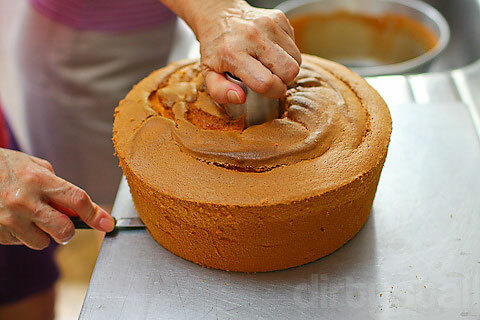 Is there a trend now with everyone seemingly getting their hands dirty on making chiffon cakes? Hmm.. lovely pictures and yes, it does look like the real deal! Nice work! Thanks! Maybe because it’s one of the staple and basic cakes to bake so everyone tries it out first. There aren’t much ingredients or steps to do, but if you read Dr Leslie’s post on making it, there’s a lot more to it than meets the eye at first hahaha! SO COOL! I love the colors.. this cake is so much fun!! hello! just wanted to let you know that this post is featured as a “Todays Specials” post on the FoodPress.com homepage today! Definitely a unique cake recipe and love the bright color! Thanks for sharing! That looks mouth watering! I was just looking for some recipes with pandan as before we cannot find pandan leaves here in New Zealand but was an extact in Asian Shop so its pandan cooking time, I really missed those flavours as I remember growing up as a child we have this plant at our backyard way back in the Philippines and every steamed rice we have we always place a leaf on it to give that good smell and distict taste. Yup it was just plain flour. hi, you did not use sugar? I think the essence should be fine but I can’t comment on the taste if used since i’ve never tried it before.